The thrushes are a family, Turdidae, of passerine birds with a worldwide distribution. The family was once much larger before the subfamily Saxicolinae, which includes the chats and European robins, was split out and moved to the Old World flycatchers. The thrushes are small to medium-sized ground living birds that feed on insects, other invertebrates, and fruit. A number of unrelated species around the world have been named after thrushes due to their similarity to birds in this family. 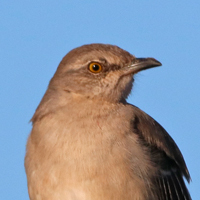 Thrashers are a New World group of passerine birds related to mockingbirds and New World catbirds. Like these, they are in the Mimidae family. Utah has recorded 19 species of Thrushes and Thrashers.